Early 1900’s, CPR mile 111, La Riviere Division Point looking S. This shows some detail of the brick yard with kilns, coal dock, round house, turntable and station. “May 29, 1902, A company has been formed in Winnipeg for the manufacture of bricks at La Riviere, made from shale.” Quote from the (2012, June 7) The Southern MB Review, p. 4. Photo from the collection of – B. Schuff. Hello Neil–from a fellow modeller of the LaRiviere Sub (early 1900s–in Nscale). I am perplexed by the various photos of the coaling tower. On two of the photos, the coaling station seems to have no roof. I have not been able to find photos of similar designs. Any thoughts? Hello Hans, Thank-you for following my Blog. 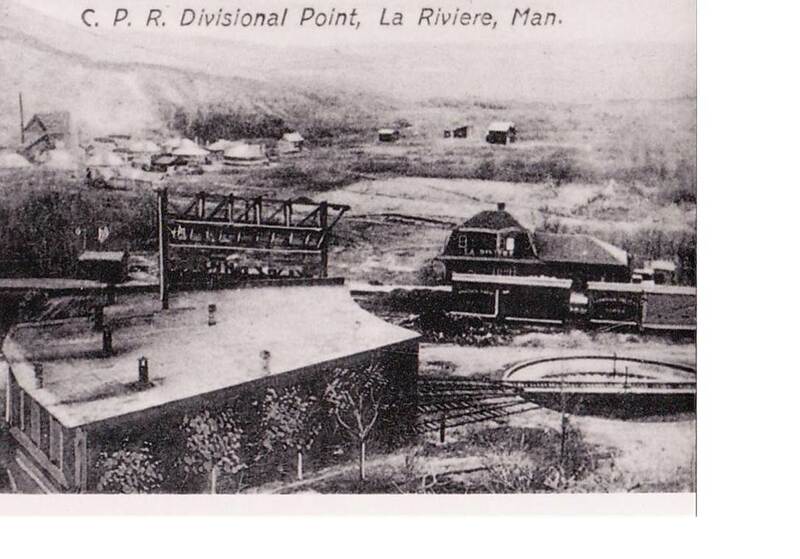 The La Riviere Yard had two coaling facilities at different times. According to CPR Insurance Records in a letter from CPR Archives dated October 25, 1988, the first coaling dock across from the railway station in LaRiviere existed before 1922, because 1922 was the year of construction of the second facility the Coaling Tower,which was located next to the stock pens on the West end of the rail yard. After looking through some of my documents and pictures, I must say that the best photos I have of the Coaling Dock before 1922 are Posts 219,211 and 210. Yes, I agree that the coaling dock appears to have no hard roof. Were tarpaulins used, or no cover? I am also puzzled as to how the coal was lifted up in the dock so that it could be loaded into locomotive tenders. I do not see a ramp. Maybe you have some insight. For further research, you may want to contact CP Tracks on the internet. Now for the Coaling Tower located at the west end of the yard. There are three Posts of Coaling Towers, Post (240 LaRiviere) and Posts (242 & 242 Spences Bridge, B.C.) which according to my research had a similar CP Coaling tower to LaRiviere. According to Insurance Records, this tower was built in 1922 for $8000.